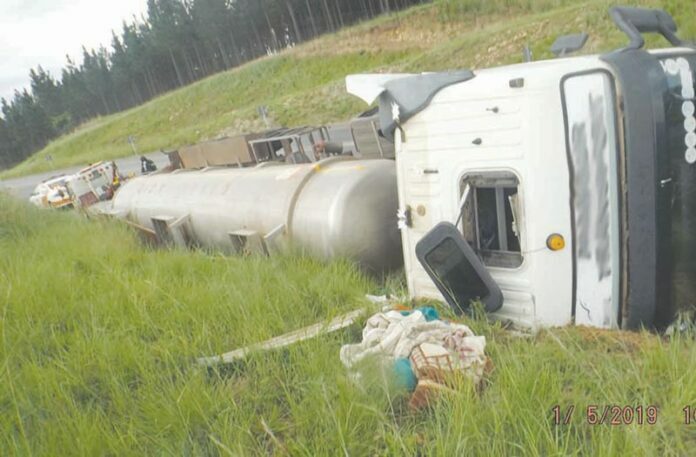 During 2018, the Excelsior News reported on five separate events where foreign heavy motor vehicles, transporting hazardous chemicals, were involved in accidents on the Pongola road. Strangely enough, all these accidents occurred within a 10 kilometre radius of each other, on exactly the same stretch of road. In some of the accidents mentioned before, the road surface sustained some serious damage due to chemical spills and SANRAL (the South African National Roads Agency) was contacted regarding the repair of the damaged road. 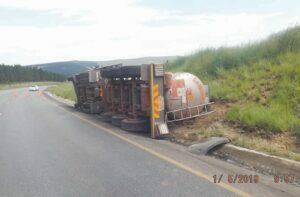 The stretch of about 10 kilometres on the Pongola road was repaired and the necessary action was taken pertaining to chemical spills. Needless to say, on Saturday, 5 January, at around 09:50, a Zambian heavy motor vehicle, carrying dangerous chemicals, was involved in an accident – in exactly the same area as all the others of last year! The truck driver stated that due to bad weather conditions, he lost control of the vehicle and it overturned. Emergency personnel of Mkhondo rushed to the scene, barricaded the area and made sure that all chemicals that leaked from the truck were quickly contained. No one sustained injuries during the accident and the road was opened soon after the accident. What could be the problem on this stretch of road that results in truck drivers, carrying hazardous chemicals, continuously causing accidents?